Paraphrasing Steve Jobs, remembering that you'll be dead soon is the most important tool you have for helping you make the big decisions in life. Progress Bar helps push you along by putting that reminder right in your Mac's menu bar. Set the times you start and stop your day, along with your birthdate and life expectancy — in the US it's dropped for the third year in a row — and it will tell you the percentage left of the day, month, year, and most importantly, your life, giving you a not-so-subtle reminder to live your best life right now. Instead of making you pick from a vague, spa-like list of background noises, Endel intelligently uses a range of factors to create its own. Its algorithm takes into account your location, time zone, weather, and heart rate to come up with sounds that are meant to help you focus, relax, sleep, or provide you with a tempo-based soundtrack when you're on the go. At the end of the week, it wraps all the data it's gathered into a nifty visualization, so you can see how you did, and where to improve going forward. CloudFlare's 1.1.1.1 DNS service launched last year for desktops and laptops. We've been using it since launch, and it's rock-solid. The fastest public resolver, it's now available to speed up your mobile experience. 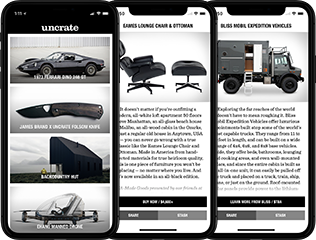 For those unfamiliar, the Domain Name System, or DNS, works like a phone book for the Internet, resolving those easy-to-type addresses — like uncrate.com — into the IP addresses of their servers. 1.1.1.1 is built for speed, and as an added bonus prevents your carrier from tracking your browser history, which by itself is enough reason to use it. It is what it says it is. Minimal Calendar is a phone calendar stripped down to its basics, rendered in gorgeous clean typography. The current year, month, and day are labeled with red type, while everything else is black, set against a white background. It supports basic functions like adding and editing of events, plus helpful reminders, and integrates with Apple iCloud, Google, Exchange, and all iOS supported calendars. People with motor impairments may not have the easiest time controlling their phones with their fingers, and lord knows Siri can't do everything. Hawkeye Access is a new ARKit-based app that lets you control things using nothing but your eyes. After a brief calibration process, you'll be dropped into an interface with a cursor that moves around the screen with your gaze. Smile or blink to click, stare into the bottom, sides, and corners to navigate, and use your voice to enter search queries. Currently, the app contains a web browser with quick links to services like YouTube, Twitter, and Instagram, but given its utility, we wouldn't be surprised to see this functionality baked into iOS in the near future. For image editors, Photoshop was one of the only things holding the iPad back from being a full-blown laptop replacement. Essential word being was. Adobe Photoshop CC for iPad will arrive next year, giving users access to all the retouching, compositing, and layering tools they enjoy on the desktop. It syncs all your .psd files via Creative Cloud and has a context-aware UI that gives you quick access to the tools you're most likely to need next. Taking the place of a traditional film scanner, FilmLab adds to the list of photography tools replaced by your phone. Simply lay your slides or negatives on a light table or other backlight and open the app: it lets you check out negatives and proof sheets, with a live preview of what they'll look like as positives. Custom algorithms combine multiple photos to get the maximum detail from each shot, and built-in tools let you crop, rotate, flip, and adjust exposure and color balance before saving the digitally preserved shot out to your camera roll.